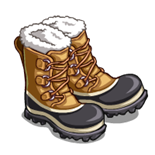 Notes: Snow Boots drop from Flax. Snowin' Shoes are crafted. We received a Supply Dog from the previous mission. Each Shoes require 5 Jute Strings (Buddleia) and 5 Broken Racquets (Wall Post).